Flint Expatriates: Will Hipsters Save Detroit and Other Shrinking Cities? Will Hipsters Save Detroit and Other Shrinking Cities? After years of chronicling just how bad things have gotten in America's shrinking cities, the national media now seems obsessed with stories about how to save places like Detroit. It's a welcome change, although the coverage often tends to underplay just how much work remains to be done, while overplaying the role of urban homesteaders and other newcomers in the revival. Last month, Thomas Sugrue, the scholar who literally wrote the book on Detroit, traveled to the Motor City to deliver a tough message to business and political leaders. Detroit's comeback, he said, depends on whether the city can improve the lives of working-class African-Americans. "Revitalization" is a buzzword in the city, which filed for bankruptcy last year and grapples with widespread blight and high unemployment and poverty rates. In spite of all this, Detroit is often celebrated as a hipster paradise and tourist destination by national media outlets. But Sugrue said Detroit's recent successes in its downtown area and in Midtown, the city's cultural center, aren't benefiting the majority of residents. While it lacks the emotional appeal of stories about the young idealists who venture back to these struggling cities, land banks are a more far-reaching and clear-eyed attempt to help places like Flint. 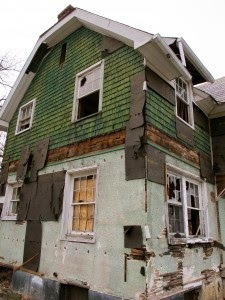 They don’t focus on getting residents into abandoned housing; instead, they concentrate on eliminating empty structures. Admittedly, the land-bank approach appeals more to the head than the heart. It requires cities to let go of the past and admit they might never regain the growing populations, thriving economies, and broad middle-class prosperity of the post-war boom. Though it’s not an economic plan that will generate new jobs, it is a logical step toward stabilization and it lays the groundwork for the future. 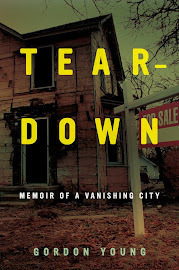 There’s no silver bullet that will solve the problem of abandoned houses in America’s shrinking cities. Well-meaning Rust Belt expatriates like me can lend a hand. Dedicated urban homesteaders can save some houses with money, carpentry skills, and sheer force of will. Innovative projects like Detroit’s Write A House, which gives a renovated home to writers who move to the Motor City, can play a role in stabilizing neighborhoods. But the staggering number of empty houses means that these laudable efforts are only a small part of the solution. Land banks and other initiatives to demolish the structures that no one wants will have a far greater impact. C'mon Gordo, you're just begging for hipster hater comments. Hipsters are society's #1 whipping boy. Hipsters get goofed on, but they are alright. Hipsters are great for opening boutiques, but they don't have kids and won't create a critical mass in Detroit. Hipsters tend to concentrate in certain areas as well. You will never see a large cluster in Saginaw or Gary or Youngstown. The ones we got in Flint are so behind the curve it borders on quaint. Flint's hipsters are operating at about a 2005 level of hip. Plus a lot of them are covert Christians. That in totality qualifies them as squares. Flint needs refugees and immigrants of foreign extraction. Aren't I allowed to engage in a little meta-journalism once in a while! I am technically not covering hipsters here, I'm covering the coverage of hipsters, thereby placing me above the fray. It's a grand journalist tradition, frequently practiced by the NY Times. All kidding aside, it has to be annoying for actual longtime residents of these cities, who do the heavy lifting day in and day out, to see arrivistes hogging all the coverage. And I say that fully aware that I just wrote a book about a guy from San Francisco returning to Flint to try and "save" the city. Can we pick on the Christian cobbler dude? That guy is absolutely grueling. Usually, when you think of Michigan hipsters, you think of Royal Oak, Birmingham or Ann Arbor. But there is a growing group of hipsters in Traverse City. I had a strange encounter with a Traverse City hipster on another board. This hipster was from Bloomfield Hills. His online posts expressed a lot of arrogance and he obviously looked down at me when I told him I was from Flint. I asked if he knew a prominent Traverse City businessperson and he indicated that he not only knew her, he spent a lot of money at her business. Then I asked if he knew she was from Flint. He didn’t believe it. I gave him the name of a mutual childhood friend and even the name of her babysitter in Flint. He confronted her with the names, and she blushed and admitted she was from Flint, but only after telling him that I was a “geek”. He then even went so far as to tell someone on a this other message board that I should not be admitted to the secret “elite” section of that message board because I was a “geek”. I was blackballed from the elite section of a message board on the second hand word of a Traverse City hipster! As Ray Stevens once said, “you are out of the shrine”. How can being from Flint be such an embarrassing thing that being outed as a Flintoid is such a big deal? I guess this business person’s theme song should be “I’m Living In Shame” by The Supremes. Maybe we need to change the lyrics to a James Brown song and “Say It Loud, I’m From Flint and I’m Proud”. As I wrote in Teardown, even people from Detroit look down on Flintoids. I was on your side until you quoted Ray Stevens. Gordo, can you please blackball this geek. Um, who is Ray Stevens. Seriously. And blackballing someone for complaining about being blackballed just doesn't seem right! Well, both James Brown AND Ray Stevens are acquired tastes, but I am a fan of both. Both are not without controversy. James Brown fans are in denial about what the lyrics to "I Don't Want Nobody To Give Me Nothing (Open Up The Door, I'll Get It Myself)" say. "Living In America" is a watered down version of the meaning. Flint will someday succeed again with that philosophy. Here are points of context for both. Traverse City needs "saving" ??? Ha, not by hipsters, or anyone else for that matter. Apparently the word has become meaningless. I went to TC for a book event last summer for the first time in probably 30 years. I was stunned. I couldn't believe how big it was. I had a similar experience when I went to Grand Rapids last summer. I hadn't been there since 1978 when my brother and sisters were at Aquinas College. Back then, the downtown was DEAD! Now it's an actual city. GR is legit... I'd say it has just about reached the level of Omaha and perhaps Louisville in terms of hipness, bizness, and activity. Well, Traverse City does have its downside, the worst of which seems exemplified by Madonna's brother Anthony Ciccone, the poster boy for Traverse City social problems. I guess they think social problems make a city "hip". My "friend" who blackballed me also doesn't believe that I also knew Anthony 30+ years ago. What the heck did Anthony Ciccone do to invoke so much ire? I got to believe if he is the personification of TC's urban problems there are a lotta cities that wish they had those problems. Anthony Ciccone has not provoked ire in Traverse City. What he has done is provide a convenient target of guilt induced sympathy from the population who is mainly insulated from the violent crime and other problems affecting larger cities in Michigan. Frankly, if he weren't related to Madonna, Anthony would probably be ignored or even victimized by youths and authorities, as is frequently reported in large cities. What city has ever been "saved" by hipsters? Or artists, or "refugees and immigrants of foreign extraction". The only thing that "saves" a city is economic activity...dollars from the outside in return for goods or services provided to whoever has those dollars. Traverse City sells its location and vacation/entertainment amenities. They don't sell "hip" or cool or whatever. GR's art events are successful because there's a market for them, composed of regional residents with disposable income. Chicago isn't Chicago because it's cool...it's an economic center. We used to sell lots of vehicles, and we still sell quite a few so we aren't going away entirely. But we can't very well sell location and vacation/entertainment amenities, and adding to our hipster population would have a negligible affect on our ability to produce goods that other regions would pay us for. Hipster boosterism is only of value to people who think of themselves as hipsters, or wish they could. Dallas is an economic center too, but it is a bore. Immigrants keep neighborhoods, schools, churches, and communities thriving for generations in many cities. Hipsters do a ton of great things, the only prob is their impact is limited and they tend to receive too much credit and exposure. Hipsters sometimes give a boost to many down and out neighborhoods, and in those circumstances they deserve some credit. They do tend to cluster WAY too much often going beyond a critical mass in some areas. EVERY neighborhood and town in 'merica could benefit from a smattering of hipsters. I hate the using the word "saved" when referring to urban areas, but give the Somalis in Lewiston, the Mexicans in Chicago, and the Yemenis in Hamtramck their due. Immigrants drive the economy. After the Mag Mile the biggest tax revenue generator in Chicago is La Villita. Whether or not hipsters bring business to a community or not, they do affect rankings on various surveys of Best and Worst Cities and such. Traverse City only has a full year population of less than 15,000. The impression by my "hipster" blackballing "friend" is that it is much larger. The so called Traverse City MICROPOLITAN Area encompasses four or five counties and has some 140,000 residents. Because you rarely see the Flint METROPOLITAN Area population quoted, and because it only encompasses ONE County, Genesee County(Population 425,000), many people now perceive Traverse City as larger than Flint, because the population is quoted as 102,000 and people don't understand the difference. Well, since my last post, I have gone underground and I am doing a little research project on Flint expatriates. That is, actual expatriates with a small "e". The research is unscientific, but I found a Mother Lode of Flint expatriates by following "Friend" connections in "Six Degrees Of Separation" fashion. My results so far? At least a HALF A DOZEN Flint expatriates who have BURIED THEIR FLINT EXPATRIATE HISTORY IN THEIR FACEBOOK PAGES! Often, even with pictures, changes over 30-40 years made these persons nearly unidentifiable. I recently followed a lode from an unusual surname which has been in the news to another four or so profiles with common surnames and given names which were impossible to find otherwise. Same thing. Flint references are BURIED, often only present in a common recognizable FRIEND name. Even then, references to the Genesee County Clerk site to get spouse surnames were necessary to verify the information. Often, OBITUARIES were the only thing that verified the FLINT CONNECTION. Special thanks to Mark Zuckerberg, Flintoid descendant Larry Page, John Gleason, Mike Carr, mlive.com, and Jim Rockford (yes, the TV character) for making this research possible. Conclusion: My Traverse City businessperson acquaintance is FAR FROM ALONE in hiding her Flint expatriate connection! Oh man, are you ever a dullard. At least Jim Rockford got laid every once in a while. Nice try, Licky Reach, but I refuse to let you besmirch the name of a great American sportswriter. Even though I have no idea who he is. You sure you aren't hitting the wine cellar? I fail to see how the comment reflects on Len Hoyes. I suspected that YOU are "Hen Loyes", but whoever the poster was who posted as Hen Loyes, this had NOTHING to do with the reference to a fictional character, Jim Rockford. I posted as Licky Reach in response to the Hen Loyes moniker. I also considered Moug Dintline and Gou Liampetroni, but Licky Reach just sounded better. Ich bin nicht ein Hen Loyes. How dare you, sir! I don't even have a wine cellar. I forgot. There are few cellars, let alone wine cellars, in California, because of earthquakes. That is why sitcoms made there have ridiculous things like laundries and bathrooms in garages. I'm sorry if you misinterpreted my comments as "besmirching" Len Hoyes. They were intended as a humorous response to the Hen Loyes comment about Jim Rockford getting lucky. I really have to find a better forum for my writing. I'm very very tired of people picking fights with me over nothing on this and other message boards. I think I will have to take a hiatus from message boards. They're wasting way too much of my time anyway. Don't go, man. I'll try and put a wine rack in my laundry room if that will help. Just cram your hamper with a dozen or so bottles of Mad Dog and call it a day. If you will cop to at least occasionally posting under another screen name here as a random Flint Expatriate just to generate Buzz and Controversy, I will stay. Otherwise, Licky Reach is gone like the 1978 Wichigan Molverines. Once again, I am outraged! Gordo- Don't admit to anything. Licky- Beat it. You're a buzzkill. So who are you, Tony Fiore? F. Lee Bailey? Don't admit to anything. Where have I heard that before? Oh, those legal TV shows. Licky's my man. Me likey. Licky is a poor man's version of the legendary WÚrs†side Wå®lØrd. Hit the road with your two-bit anti-humor. Nobody likes Licky except a nobody. This faux-grassroots astroturf azz groundswell of support for Licky Reach is bogus- fake as a snack cake to use Flint slang circa 1998. Gordo, can this loser before I call the internet police. Son, I knew Licky Reach. Licky Reach was never so defensive. Licky Reach had a sense of humor about himself. Licky Reach was confident, not cocky. No sir, you are certainly no Licky Reach. Hen Loyes, Licky Reach, Moug Dintline, Jordon Woung, Len "Zodiac" Hoyes, and Jim Rockford are ALL fictional characters. As such, their characters cannot be besmirched. Methinks that Jordon Woung protesteth a bit too much. Touchdown Licky Reach! Touchdown Licky Reach! The Guts and Glue of the Blaze and Moo! Go 1978 Wichigan Molverines! Honk! Honk! Honk! Licky Don't Ruse That Number 7!